SPG has a new offer for US Airways Dividend Miles members that stay at Aloft, Element or Four Points hotels in North America between June 1 and December 31, 2013, for 1000 bonus miles per stay and $10 F&B (food and beverage) credit. You must choose airline direct deposit and have US Airways as the airline partner. You need to book SSBMILES rate offer to be eligible for the bonus miles. You can access SPG’s website for this offer here. I checked the rate for a midweek one night stay at Four Points LAX using this promotional offer and all the other rates that this property is offering. 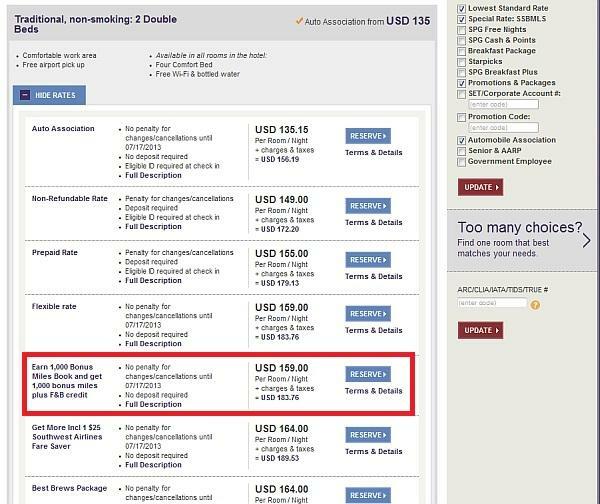 The 1000 bonus miles rate is about $24 more expensive than the lowest AAA rate. Seems that at least in this instance the 1000 bonus miles rate is the same as the best flexible rate. This promotion could be worthwhile for those that collect US Airways or American Airlines miles, as the Dividend Miles will eventually become AAdvantage ones. US Airways currently has a 50% bonus on car rental and hotel transactions that are direct deposited to Dividend Miles. You can read more about this promotion here. 1,000 bonus miles per stay will be credited by US Airways to the member’s account within 4-6 weeks of the stay posting to the member’s Starwood Preferred Guest account.